Our Outdoor Partners are crucial to the success of TerrApparel and are the lifeblood of this company. Through their years of knowledge and experience, we are able to gain the feedback we need to create the best product possible. Anthony DiGiovanni: Powder stomper and backcountry romper. Skier by winter, all-purpose outdoorsman by summer. Enjoys hiking, mountain biking, slack lining, rock climbing, camping, and just about any other outdoor adventure! Aimee Gilbert: We own a small farm raising Hereford cattle, Saanen dairy goats, pigs and chickens. The future of our enviroment is vital to being able to eat healthy locally raised food. 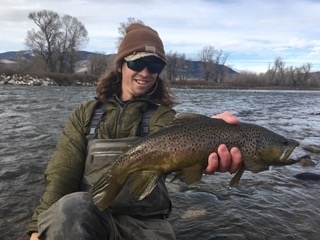 Matt Lacko: Aspiring fly fishing and raft guide in Montana. tying flies, skiing, and hiking top the cake with a frothy coat of icing. Renee Levy: At the end of the day, seeing the view at the summit of a mountain or a sunset/sunrise are some of the most peaceful things to experience. Just being able to enjoy the natural beauty that this Earth has to offer is truly amazing! Shawn Schneider: The outdoors are peaceful, serene, and rejuvinating after long stressful weeks. No matter what it is, I prefer to be out in the wild exploring and relaxing. Anna Izzo: Most of my time outside is doing fun activities! I was a competitive nordic skier for 11 years, and growing up in the small Adirondack town of Lake Placid helped instill a love of nature at a young age. I enjoy skiing (both nordic and alpine), hiking, running, yoga, swimming, and biking (both mountain and road), just to name a few! I also thoroughly enjoy fueling my body with yummy recipes made from foods in their most natural form. Clay Larson: I love me some good hikes. I like to smack 'dose slopes all day long. I like to capture dem fish. I also like to camp. Our Outdoor Partners are our link to tight knit communities within the outdoor industry and provide vital feedback in order to create the best products possible. Click here for details. Describe your love for the outdoors, and how you enjoy your time outside.